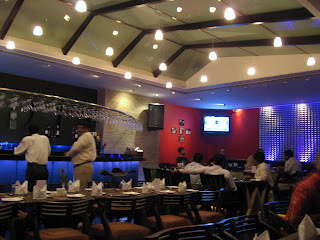 A good percentage of visitors come to this blog hunting for places to eat and drink in Pune. Given how this city is rapidly transforming into the preferred destination for business, there are new restaurants, bars and lounges opening every week. Therefore, here's another update on the newest - and best - places in Pune to eat, drink and be merry. Finally, one can savour good quality Japanese cuisine in town. O Hotel's Harajuku restaurant has a rich red, gold and wood interior with a sushi bar and a teppanyaki live counter. They claim to fly in fresh fish and condiments, and the sushi certainly tasted good on the day I visited. 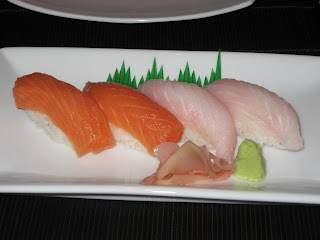 We began with Nigiri Sushi and chose Sea Bass and Salmon; unfortunately, Yellow Tail and Tuna were not available which reduced the choices on offer. The sushi was freshly made and tasted good; the accompanying condiments, including wasabi, were of high quality too. We moved on to Temaki Sushi. 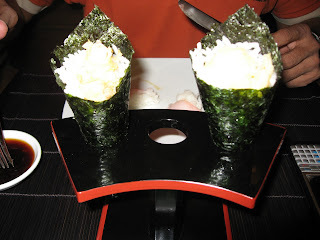 The nori seaweed cone filled with sushi rice and tempura prawn was very tasty. 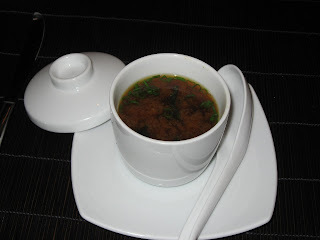 The mandatory Miso Soup was next which I thought had been spiced up for the Indian palate. 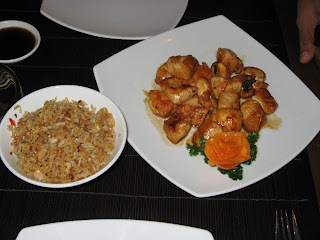 Finally, we had the teriyaki chicken with egg fried rice. All in all, a good lunch. Japanese food has finally arrived in Pune. Other restaurants opening in this interesting hotel include the Kitsch - a 24 hour coffee shop with an eclectic art deco interior, Addah - a rooftop grill, and Minus - which soon promises to be the next hotspot in town with its chilled ice bar. The O Hotel is located close to the German Bakery on North Main Road, Koregaon Park. Ph: 40011000. India's most well-recognized TV chef brings his food to Pune. Here's your chance to try some of the stuff you saw him cook up on Zee TV. I remember eating at the Yellow Chilli in Noida a few years back. He since took this restaurant brand to cities in his native Punjab before coming to Pune. Yellow Chilli is located in a bungalow surrounded by lush green lawns and ample parking. The unique thing about this restaurant is its dual personality. During lunch, they serve a buffet with a live chaat and dal counters. At night, the ambiance transforms into that of a fine-dining restaurant. They even have different uniforms for the waiters: a rust colored attire during the day and a sparkling turquoise attire to suit the soft lighting in the evening! The interiors are classy and contemporary. However, the layout of tables leaves a lot to be desired especially during lunch buffets which get crowded. The buffet itself has a lot of options both for the vegetarian and the meat lover to choose from. The prices are very reasonable too. I loved the sheek kababs, chicken tikka, and the gosht biryani the most. Other interesting items included Achari Bhindi and Murgh Teen Mirchi. Desserts were simple: rasgullas, sewai kheer, and a few burfis. The a la carte menu includes his popular Shaam Savera, a spinach kofta stuffed with malai paneer in a tomato and honey gravy. Other favorites are the Lalla Mussa Dal, Kadhai Prawns, Nimbu Paneer Tikka, Murgh Yakhni, Lall Murgh and Raan Buzkazi. Another buffet restaurant, this time from the folks who brought you Malaka Spice. This time, the food includes Indian delicacies along with European and Oriental items too. A large, glass-fronted seating area, a well-stocked bar, and live performances round off your dining experience. While I myself haven't yet entered their sit-down restaurant, I have sampled their food in the banquet area and found the selection eclectic and good. If you are wondering what the name means, it refers to India's dramatic rise post-1991; that year Manmohan Singh set in motion the opening up of India's economy. I would have chosen 2000, which was when the world began depending on India to save them from impending Y2K disaster and made Indian software a global phenomenon! The owners of this restuarant aim to present Indian haute cuisine in a creative, modern setting. This is probably the only place I have seen in Pune who serve pre-plated Indian food, where presentation gets special emphasis. This 60-seater restaurant opened just a month back, and early reports suggest the food is definitely worth trying. Friends recommend the Hyderabadi Dum Biryani, which comes in a matka, a small pot. One of them said the Rogan Josh was alright but the Lahori Murg had a delectable gravy worth trying with naan or lacchha paratha. Another one recommended the Chicken and Dill Soup before the main course. He also thought the Lucknowi Gosht Seekh and the Nalli Nihari were both outstanding. They all say one should try the lychee coloda here. Update, Jan 2009: I hear there has been a change in ownership; I am getting bad reviews from recent visitors. Taareef in Aundh was supposed to be Kareem's (of Delhi fame). And it was for a few weeks before the owners had a falling out. While Kareem's moved to East Street, one of the partners and some of cooks stayed on in Aundh and emerged as Taareef. Taareef - like Kareem's - specialized in kababs and biryanis. They also have a variety of Mughlai curries and breads. Housed in a re-modeled apartment very close to the Pulse Supermarket in Aundh, this restaurant has a very tavern-like ambiance. Utensils of heavy brass and copper make the dining experience interesting too. As for the food, I can recommend the tandoori pomfret, the sheek kababs, the tandoori raan and gosht biryani. Some have found their gilawati kababs (on small tawa parathas) very good too. Those who have lived in Delhi will have heard of Moti Mahal restaurant which has existed almost forever. They now bring their brand of Delhi cooking to Pune. The owners of Moti Mahal claim to have invented and popularized butter chicken and tandoori chicken. If that is true, they are the culprits behind Delhi's overly conservative palate; the decade I spent in Delhi, this was all you would get in most restaurants there. Ok, I am exaggerating, but only a little! Tandoori Trail opened in Pune a couple of months back and serves a variety of Indian kababs and curries. They also have a good bar with a bartender who combines some cool moves with alcohol and fire! While I wasn't too thrilled by their Tandoori Kabab, I did enjoy the Tangdi Kabab and their signature Dal Makhni. July 2008 Update: For authentic Kashmiri cuisine, Waazwan on Baner Road was the only show in town. However, the owners of Casablanca now bring authentic Waazan cooking in their new restaurant Casanova Gold, located in Fortelezza Shopping Complex, Kalyaninagar. August 2008 Update: It's raining Kashmiri food in Pune! Another one now on Nagar Road with pretty good Kashmiri fare. Warmly lit interior with decor that ceberates Indian craftsmanship: The Northern Frontier, opposite Dass Showroom. Ph: 65619300. Note: You can find previous posts on the best Pune has to be offer on the right-hand sidebar of this blog under 'Pune Posts'. Thank you for your honest feedback on The Yellow Chilli. 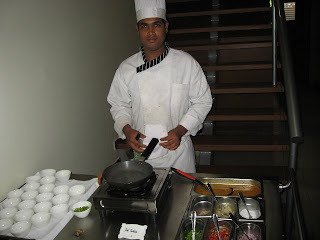 We at The Yellow Chilli ensure that our guest get the best in Cuisine and service. If there is any way we could make you experience at the restaurant better please feel free to talk to our Restuarant General Manger Mr. Guruprasand or myself. Hope to see you soon at The Yellow Chilli. Nothing says definitive authority better than restaurants leaving comments on your food blog, even if it is the marketing manager! I need to get to Pune! Shantanu, thats a good list. I've got to try some of these places out when I visit Pune next :) Thanks! @Yellow Chilli: I am impressed you are monitoring blogs online! @beaverboosh: Ha, ha! It is a beginning. @priyank: Certainly! Let me know when you are planning to be here. We can trade travel tales over dinner or something. @deepti: Yup, do that. And put another comment here with your own inputs on the restaurant. It's been ages since I've been to Pune. Probably time for a trek in the Sahyadhris. Thanks to your post, I'll know where to eat when am there next! Im echoing celine..havent been there in ages..my husband is off to Mumbai this weekend on work..should I tag along ? @indicaspecies, lakshmi: Would love to host you here whenever you visit! Let me know in advance. mast list. Have been wanting to try out all of them but just can't get myself to. I discovered this quaint little place in Aundh called "Simply Idlicious". The best south Indian I have had after matunga, Mumbai. @vishal: Thanks; especially for pointing me to Idlicious. I have since found it indeed a good discovery. Thanks for visiting my blog and your comment. This pic of sushi looks delicious. I would love one day to visit India - so exotic. @deepti: This was lunch, I guess. They don't serve buffets in the evenings. Evenings are when the ambiance here gets better. @joanne: Our only (good) sushi place currently! 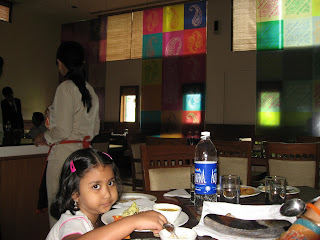 "A good percentage of visitors come to this blog hunting for places to eat and drink in Pune.".... If you show us these good pictures who wouldn't ? Thank you for posting this information. I am a regular reader of your blog. @cuckoo: Haha! I guess that's the point of my posting pics. 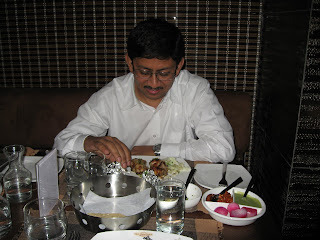 Hey Shantanu, Nice blog and the snaps add to the foodie touch! Although I bag to differ with you in case of Yellow Chilli. I had a pathetic experience, food wise and service wise. (Hope, the manager is still monitoring this blog :) ). I didn't know that Shaam Savera was the popular dish. It should be the worst dish I had in years. The tomato gravy was totally uncooked. I could go on and on, on the trauma I had eating at yellow chilli that day, but prefer to this much criticism for the time being. @beena: Thank you for the review! I guess one of the key things in a restaurant is consistency across multiple visits. I remember Sigree used to be inconsistent in quality during their initial days. Zafrani Zing is quite a concept. I haven't seen anything like it in Pune. I'd definitely vouch for the food and the way it's presented. I had been there a few times in April-May and, perhaps because they'd just opened the place then, the prices were pretty low. You'd hardly see an item on their menu for 200 rupees. That may have changed now, given what inflation has been doing! Great blog, would love to come back. I have recently been going to Nawab's and though it isn't exactly a new eat out, I don't see it discussed in too many circles. You may have already been there, would have wanted to know your thoughts on it. If you haven't yet been there, this is the place to head to sample good Lucknawi / Awadhi cuisine. They have the best Indian breads to offer (Sheermal, Taftaan, Gilafi Kulcha) and some very delectable mutton preparations! @arindam: Thank you for the review of Zaffrani Zing! I do know of Nawab; actually they have been around for a while. I listed their lounge area in the post on Best Bars in Pune. You are right the have some exotic breads and their Gilawati Kababs are good too. Those are in my list for next visit. btw, my elder brother is named shantanu ghosh too... thats why i was even more intrigued to read through your entire blog ! @Sabyasachi: Welcome to my blog. I read about a new place in Pune that's on the terrace of some hotel. Does anyone know the name of the place? @Aashish: New? I can only think of the O Hotel's rooftop restaurant. However, there is a new restaurant on top of the ICC Complex too, the Indus Kitchen. Just wanted to point out re: the post by the Marketing Manager@The Yellow Chilli (Mr. Gerald). I found it extremely off-putting and disgusting that he (under a couple of screen-names) posted 'reviews' of TYC on all the 'regular' food review sites (mouthshut, burrp, citipals, etc.) WITHOUT disclosing that he's writing on behalf of the management (little surprise that all the reviews are 5-star rated). Shame on you, Sir. @Aditya: Actually there are a whole bunch of new options in town...haven't been finding time to review them all. The Great Kabab Factory at the new Radisson in Kharadi is a good option (only dinner, approx Rs:800 per head). Another is Prego, the Italian restaurant in the new Westin. Among mid-range options, you can try Kokum at Viman Nagar or the newly renovated Flags (near Inox). Interesting. Was thinking of Casanova (but heard its deteriorated quite a bit) or maybe Stone Water Grill (again, supposedly has issues with service sometimes). Hadn't heard of Prego though, will look it up. If all else fails, Mainland China's always there as backup! ;) Thanks for the prompt response. 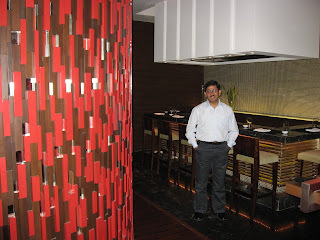 @Vishal Pipraiya: Yes its one of the best south indian restaurants i have been to. And i specially loved the idlis. Though i found it expensive when compared to restaurants of the same genre.